The Ford Fusion has been getting a lot of attention this week. The line of hybrid, gasoline and all-electric sedans carried the title of office car of the 2012 Consumer Electronics Show, and for good reason. The entire line of Fusions is chock-full of gadgetry and automated goodness. 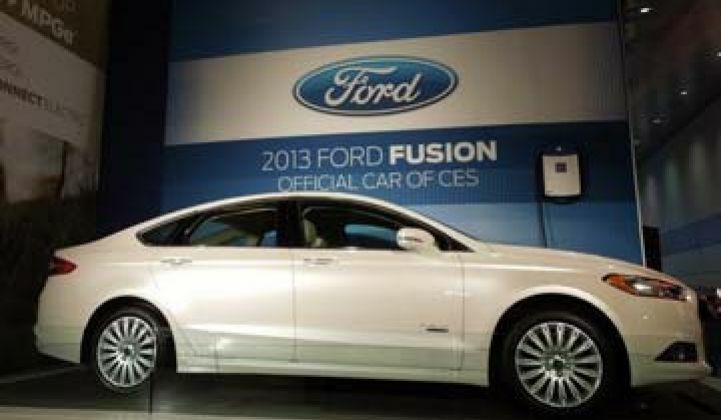 Besides the voice-activated Sync AppLink that comes on a range of 2012 Ford models, all plug-in hybrid and electric Ford models will come with the MyFord Mobile app, which claimed a "Best of Innovation" award at CES. At first glance, the MyFord app, developed by Ford and Airbiquity, looks similar to other EV charging apps. It can find charging stations, monitor charging and deliver alerts. But it also has a social media component, where people can compete on leaderboards on how much gas and CO2 they’re saving. Airbiquity also partnered with Allstate to offer connected vehicle services, including remote door unlock to finding my car and roadside services. A connected car was a theme of CES, similar to the connected home. It is not longer about just having an internet connection for radio or safety. It's about Facebook, remote controls for pre-heating the car or unlocking the doors, music and media options galore, and even health-related apps. It's also about delivering all of this capability in a safety-focused format, so you won't drive into a tree as you tweet about your morning commute. The level of connectivity in electric vehicles could serve them well as car makers look to push them into the mainstream. Having seamless connections from your car to your home and ready access to chargers (both in the garage and the ability to find them on the road) will certainly make it more palatable to people who like the idea of going electric, but suffer from range anxiety. Also, for consumers with Ford hybrids that follow leaderboards and post their results back to Facebook or Twitter, it could create a more visible culture of electric (or at least plug-in hybrid) enthusiasts who are shouting to the world how awesome it is to save on gas money. Ford was not alone at CES touting its new EV. Mitsubishi had its i-MiEV on hand, which is already being sold in Japan. Ford’s midsize electric offering will likely be more appealing to the mainstream U.S. market, but the $31,000 price tag of the i-MiEV will certainly appeal to some who want to get their hands on an EV. It will be available everywhere in the U.S. by June. Right near Mitsubishi was Best Buy, which will sell chargers for both Mitsubishi and Ford in its stores. It will also sell Siemens, GE and Leviton chargers online. GeekSquad is on hand for installation. Although electric vehicles are barely a trickle in the overall car market, the expanding options and mainstream availability of chargers show that plug-in hybrids and electric vehicles may not be just a fad. And if is just a fad, at least there’s an all-electric DeLorean on display at 2012 CES, courtesy of Reliant Energy.